If you have ever wanted to restore your hair to a just-washed look without shampooing or even using water, then you should learn more about dry shampoo and what it can do for you. Dry shampoo has been around for 30 years or more. But those original formulas pale in comparison to today's advanced dry shampoos. You could opt for several versions available in stores. But if you want to avoid using artificial ingredients or cut down on costs, it is possible to make your own dry shampoo. You will find an excellent dry shampoo recipe later on in this article. Dry shampoos showed up in the 1970s. The idea behind them was sound. 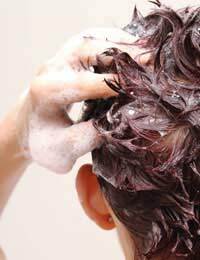 There may be times when you want to freshen up your hair and scalp without taking the time to shampoo and rinse. You may be camping in an area where showers aren't available. You may not have access to water or you may need to stay dry for some reason. Dry shampoos were designed to provide a solution to this dilemma. Unfortunately, the first products on the market did not quite meet expectations. They tended to leave the hair stiff and difficult to manage. Recently, there has been a resurgence of interest in the concept of dry shampoo and many of the major hair care companies have come on board. Several very good alternatives now exist for those who want to freshen up their hair without a regular wet shampoo. Perhaps you only need to revitalise your style at the end of the day. Or you may wish to protect an expensive colour treatment or perm. Cornmeal and almonds are quite common. Orris root may not be an everyday item in your home, but can be easily found at health food shops or online. Combine these three ingredients in a mixing bowl. Take a single teaspoonful of the mixture and massage it into your scalp. Thoroughly brush it out. If your hair still feels greasy, you can repeat the process. The amounts mentioned above will combine to make about 6 to 8 treatments of dry shampoo. By the way, make sure you use this dry shampoo recipe over a bath or sink. Otherwise you'll make a mess that will need cleaning. So there you have the basics of dry shampoo. Whether you are roughing it in the countryside or your spouse forgot to pay the water bill, you will inevitably face a time when a good dry shampoo will come in handy. If you remember your father's dry shampoo and shudder, don't worry. Today's versions are much better and have more attractive results. However, the dry shampoo recipe presented above is both easy and inexpensive. Trying it may help you decide that a dry shampoo from time to time is exactly what you needed.